If you have an interest in cultural matters, or even if you just want to go on an outing, I can certainly recommend a visit to Motoulong, also known as the Fertility Caves. This is not a typical tourist destination – and perhaps that is what makes it so special. There are no shops or restaurants, no info centre, and not even an ablution block (which may put some people off) but the sheer size of the caves, and the spiritual essence held within them is bound to move you. 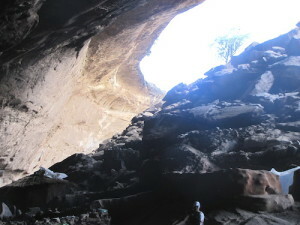 Motoulong is considered to be a sacred place and many visitors make their way to the caves (especially over weekends). Some come to worship God, some to honour their ancestors, some to seek an answer to a vexing problem (often related to fertility) and ofcourse there are those that are merely curious. To get there take the Clarens/Fouriesburg road and turn off onto the dirt road which is signposted to Surrender Hill. Follow this road until you see a gate on your right and the Haritage site sign. You may have to wait for a few minutes for someone to open the gate and pay an entrance fee before gaining entrance to a large parking area. Last December I was lucky enough to visit Motoulong in the company of Niki Roy. After parking the car, the first challenge was crossing the Little Caledon river. Fortunately, a large fallen tree trunk has bridged the river and crossing was relatively easy. We then followed a shady path which ran alongside the river – it’s an easy relaxing walk until you get to the next river crossing. The river was flowing strongly and the scramble from rock to rock in order to cross looked quite daunting. Luckily there were quite a few “pilgrims” who had formed a line to ferry their luggage accross the river. Niki and I fell in, and were soon passing parcels, blankets, and even a live chicken forwards to the next person in the line. Finally, when all the luggage had reached the opposite bank, we too were helped accross – going from hand to hand rather like two very precious pieces of luggage. Once across the river there is a short climb up to entrance of the cave. Motoulong is not really a cave in the traditional sense, but rather an enormous rock overhang, moulded by the forces of nature over millions of years, into a deep, high-ceilinged cavern – deep enough to provide ample shelter and high enough to allow for plenty of natural light. 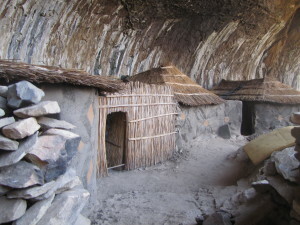 The floor of the cave is wide, smooth, and dotted here and there by well demarcated hearths where people have come to stay, along with their goats and a collection of cats. Motoulong is however, first and foremost a spiritual area. Some of the larger rocks are adorned with candles – and in the same way that I want to light a candle when entering one of those large cathedrals in Europe, I had the immediate urge to light a candle. (Luckily Niki had suspected that this might happen and she had brought a few candles along with her.) 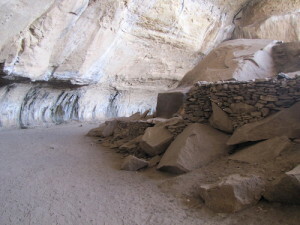 There are recesses within the cave where visitors can meditate, and some leave messages. 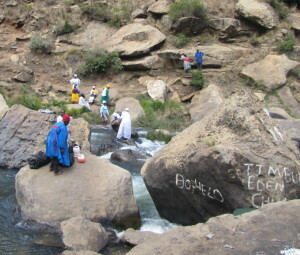 Others collect the water which drips out of the cave walls, and it is said that this is Sediba water and has healing properties. Further into the cave one comes into a very quiet, beautifully swept area. This is where Sam – a highly respected spiritual man used to live and study. Sam is has moved on but his presence is still felt as no-one lives in this part of the cave. We stopped for a while to enjoy the view and watch people crossing the river below us (a slow and careful process) before deciding to explore a path which seemed to head back towards the car-park area, rather than face the crossing over the rocks again. Our “alternate route” hugged the river bank. Having been swelled by water from Katse Dam in Lesotho, the river was flowing strongly with fresh clean mountain water on its way to relieve drought stricken areas downstream. We were right in guessing that the path would end up back at the car park area, but hadn’t counted on the fact that we would have to cross the river again – and this time without the help of a fallen tree trunk or helping hands. Eventually we found an area where the river was shallow enough to wade across – almost waist deep in the icy cold water from Katse. Our visit to Motoulong will always stand out as wonderful, memorable morning. Whilst not really a tourist destination, I would recommend it to anyone wanting to experience something different.